A tiny village in Guatemala is desperately scouring for garbage. Elsewhere in the town of San Pablo, Philippines, the locals have nearly exhausted all the available supply of plastic bottles at the dump. Both these towns are cleaning their countryside and finding interesting ways of using these materials - to build schools. Yes you heard that right – build schools!! In Guatemala, it all began with Laura Kutner, a peace core volunteer, who wanted to help the village of Granados rebuild their crumbling school. With no resources for concrete, Kutner and the village set about finding creative (read crazy) ideas with local resources. Trashed plastic bottles (there was plenty of that in Guatemala), formed the interior of the school's walls. The bottles were stuffed with discarded plastic and chips bags (that would otherwise litter the land) to give them strength, and wrapped together into blocks by using chicken wire. A thin coat of cement and paint gave the finishing touch to the walls. Finding the material to stuff 6,000 bottles required for building the school was really not that easy. Each student had to find and fill at least 20 bottles with chips and plastic bags. The process took many months and in the meanwhile, the kids cleaned up the ditches and hillsides so thoroughly that they started running out of garbage and had to go to neighboring villages! Meanwhile in San Pablo, residents of the city gathered as many plastic 1.5 and 2 liter soda and water bottles as they could find, and then used them as building material to build themselves a brand new school. Bottles were stuffed with adobe - a natural building material made from sand, clay, water, and other organic materials. Stronger than hollow bricks, the bottle adobe structure is actually about three times stronger than concrete, making this "bottle school," as it's affectionately known, quite a sturdy structure and a lot cheaper!! Glass bottles form the windows while flattened tetrapack juice cases make the school’s roof. PVC pipes inserted between the bottles serve as air vents, and reduce the need for electric fans inside the classroom. Architect Illac Diaz is the person behind this amazing project which includes a plan to build 8 classrooms and a library. Plastiki, a boat made entirely from recycled plastic, is another project using plastic bottles. 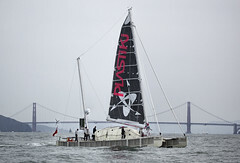 The boat is currently crossing the Pacific Ocean to raise awareness about the problem of plastic pollution. While plastic bottles have been a convenient invention, poor recycle practices have made them the fastest growing source of garbage on planet Earth. Plastic bottles are known to take at least 3 to 5 centuries to decompose. Working models in Guatemala and Philippines are being replicated in many parts of the world. It is indeed inspiring to see that what is essentially a problem to the environment, is becoming a part of the solution through sustainable construction. Can you think of innovative use of waste? If you have heard of inspiring stories of people who have created items of value from waste, write in and share it with us.